As part of our At Home Skin Care Regimes series, I have listed below some products that are suitable for Oily Skin Types. You don’t have to use all of the products from the list but the minimum required would be a Cleanser and a Moisturiser. A great cleanser to use for oily skin is the Dermalogica Dermal Clay Cleanser because it contains a unique clay formula made up of kaolin and green clays designed to absorb excess oils. It also contains extracts of sambucus, ivy and lemon to purify and refine the skins texture. Cucumber and sage will also help to calm, soothe and heal any irritation while menthol will help to boost and revitalize the skin. Dermal Clay Cleanser has a lovely thick and creamy consistency and when you use the product it is a good idea to wet your hands first. Pour a small amount, about the size of a 10 pence piece, into the palm of one hand and massage between both hands to warm the product, then apply to the face with small circular movements concentrating on the more oilier areas. Do this for about a minute then thoroughly rinse of with warm water. You can also use Dermal Clay Cleanser as a masque once or twice a week by applying to the whole face and neck or just to your most oily areas, avoiding the eyes, then leave on for 5-10 minutes before removing with warm water. The most beneficial exfoliant for a oily skin is the Dermalogica Skin Prep Scrub. This contains finely granulated corn cob meal to gently polish the surface of the skin. We call this type of exfoliant a mechanical exfoliant because of its granular texture. This product will remove any surface dead skin cells and impurities to allow any product applied afterwards to be absorbed more effectively. The skin will also be left with a bright and healthy glow, feeling smoother and more supple. Apply about a 10 pence piece amount into the palm of one hand then add enough water to make a fairly runny consistency. 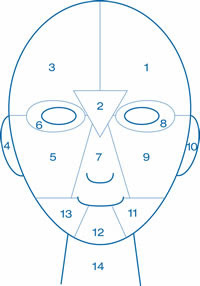 Massage over the whole face and neck for approximately 1-2 minutes, taking care around the eyes. Rinse thoroughly with warm water. Use no more than twice a week as you can over stimulate the skin which can cause more oil production. Dermalogica Skin Refining Masque is most beneficial for oily skin. It contains kaolin and bentonite to absorb excess oil, and zinc oxide to remove impurities and refine the skins surface which will help to reduce breakouts. Soothing botanicals of mallow, arnica and cucumber will help to reduce any inflammation and purifying watercress, lemon and ivy revive dull skin. It is more beneficial to exfoliate the skin prior to using Dermalogica Skin Refining Masque. Apply a smooth film over the entire face, or just on oily areas, avoiding the eyes, and leave for approximately 10 minutes or until the masque has set. Remove with warm water, rinsing thoroughly. After cleansing spritz over the skin with Dermalogica Multi-Active Toner to refresh, rehydrate and protect your skin. 3-4 pumps should be enough to cover the whole face and neck. Even though your skin is oily it is still very important to moisturise your skin, just ensure you use an oil free moisturiser. Dermalogica Oil Control Lotion is perfect for an oily skin type as it contains micro sponges to absorb and regulate oil production throughout the day, which will help to eliminate shine and give your skin a much welcome matte finish. This product contains one of Dermalogica’s most effective ingredients – salycilic acid – which will clear congested follicles, helping to prevent future breakouts. Lots of soothing, calming, anti-inflammatory ingredients have also been used which really help to ease any red, sore or inflamed areas. One of our most recently introduced products is Dermalogica Clearing Mattifier. This product is great to target oilier areas as its main benefit is to control oil and shine. Dermalogica Clearing Mattifier contains a host of ingredients to purify and minimise sebaceous activity, while salycilic acid clears congested follicles to prevent future breakout activity. A unique extract of cinnamon bark helps to reduce the onset of comedones while other ingredients soothe the skin and reduce inflammation. Clearing Mattifier has a lovely texture which melts effortlessly into the skin and should be applied after cleansing and toning just to oily areas, followed by your prescribed moisturiser. Use each morning after cleansing.